Professor Timothy Chan (MIE), director of the Centre for Healthcare Engineering (CHE), speaking to more than 100 graduate students, faculty members, researchers and alumni gathered to celebrate 10 years of CHE. 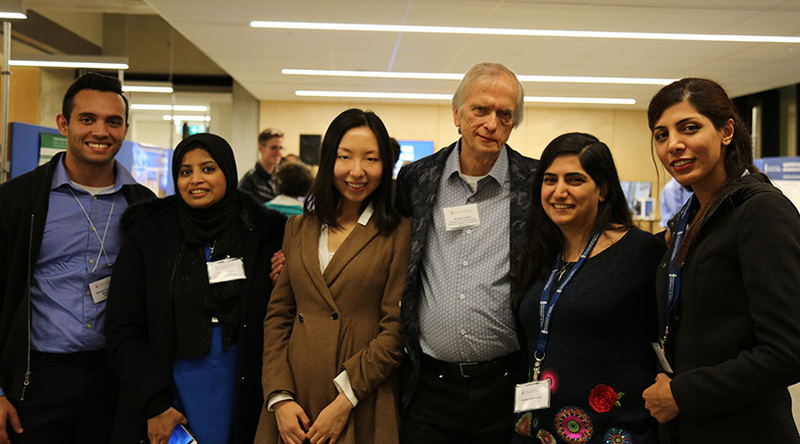 October 3, 2018 — High atop the Myhal Centre for Engineering Innovation & Entrepreneurship, a group of 100 engineering graduate students, faculty members, research scientists, and alumni gathered on October 1 to mark a decade of progress toward the goal of smarter health-care delivery. The expansive terrace on the Dr. 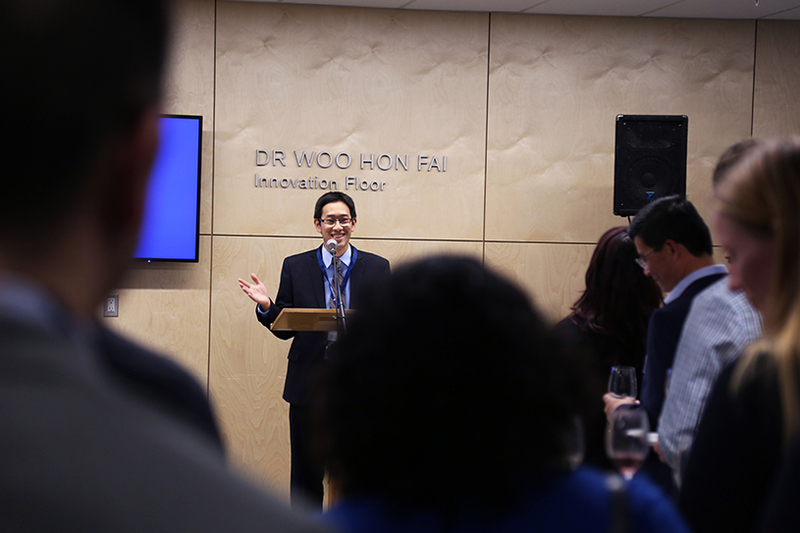 Woo Hon Fai Innovation Floor provided attendees with a breathtaking night view of the city’s Discovery District—a cluster of hospitals, research centres, and U of T—that makes Toronto one of the best places in the world to study health-care engineering. Established in 2008 to bridge academic research with practice, U of T Engineering’s Centre for Healthcare Engineering (CHE) has pioneered data-driven research to improve efficiency and enhance patient care. At the celebration, current students working with CHE showcased their latest research, while alumni discussed the state of their fields with faculty members. Many old friends reconnected over memories rekindled by the event. Professor Timothy Chan (MIE), director of the CHE, said the event felt more like a family reunion than a typical wine-and-cheese affair. After an introduction by Chan, Professor Michael Carter (MIE), CHE’s first director and a newly appointed Fellow of the Canadian Academy of Health Sciences, addressed the gathered crowd—a third of whom were his former students or associates. Prof. Michael Carter (MIE) stands with current students of CHE. 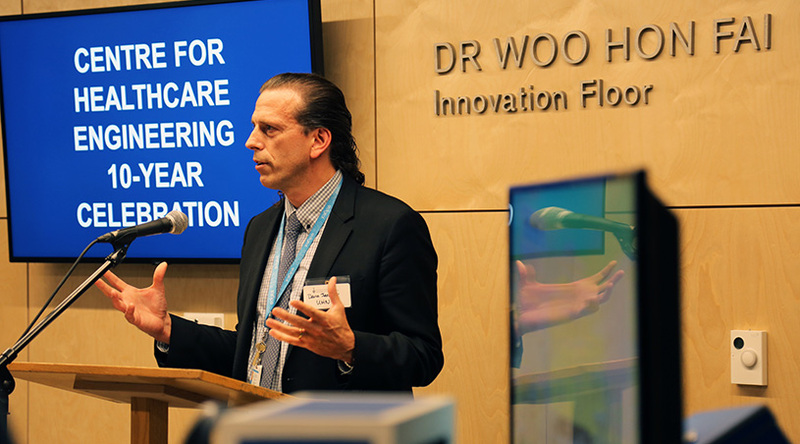 The keynote address was given by Dr. David Jaffray, Executive VP of Technology and Innovation at University Health Network, and was focused on the role engineers play in steering society towards progress. “When Captain Kirk needs help, he says, ‘Get me engineering!’” said Jaffray. He went on to explain that a hospital, like a spaceship, is a system, not a large inert object. Systems can be studied and improved, and that is exactly what associates of CHE are doing. Dr. David Jaffray, Executive VP of Technology and Innovation at UHN, discusses importance of CHE’s work. Despite big data and efficiency being a strong focus of CHE, a concern for people’s well-being remains at the heart of health care engineering. View more photos from this event on MIE’s Flickr album.